Obverse: Elephant right, trampling on serpent. CAESAR in exergue. Reverse: Simpulum, sprinkler, axe and priest's hat. 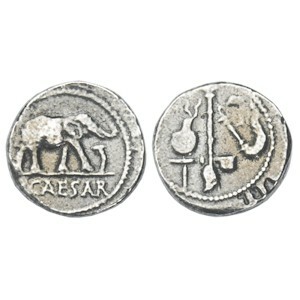 History: Struck circa 49 BC by a military mint traveling with Caesar. This is the first coin struck in the name of Julius Caesar. The symbolism on the obverse apparently alludes to the conquest of good over evil, Caesar's victory over the Gaul's, while the reverse refers to Caesar's possession of the office of Pontifex Maximus.